Apple’s CEO Steve Jobs who’s currently on medical leave has introduced the highly-anticipated Apple iPad 2 at iPad 2 event in San Francisco. According to Apple, the next-generation iPad 2 is 33% thinner (8.8mm) and up to 15% lighter than its predecessor, with up to 2x faster CPU and up to 9x faster graphics compared to first-generation iPad. In order to bring your tablet experience to a next level, the new iPad 2 adds a new powerful dual-core A5 processor, dual camera with FaceTime video calling support and built-in 3-axis gyroscope for advanced gaming experience, based on the latest iOS 4.3 platform that offers enhanced AirPlay, faster Safari mobile browsing performance and new iTunes Home Sharing. Dimension of iPad 2 Wi-Fi model is 9.50 inches (241.2 mm) x 7.31 inches (185.7 mm) x 0.34 inch (8.8 mm) (H x W x D) with weight of 1.33 pounds (601 g), while iPad 2 Wi-Fi + 3G model has similar size, but heavier weight, which is 1.35 pounds (613 g) for AT&T GSM version and 1.34 pounds (607 g) for Verizon CDMA version. The new sleek iPad 2 that offered in 2 models – iPad 2 with Wi-Fi and iPad 2 Wi-Fi + 3G, will be available through apple.com online store, brick-and-mortar Apple retail stores, Verizon, and AT&T beginning March 11, 2011, followed by 26 more countries to get iPad 2 tablet on March 25 – Australia, Austria, Belgium, Canada, Czech Republic, Denmark, Finland, France, Germany, Greece, Hungary, Iceland, Ireland, Italy, Japan, Luxembourg, Mexico, Netherlands, New Zealand, Norway, Poland, Portugal, Spain, Sweden, Switzerland and United Kingdom. No pre-order is available though. Consumers able to start buying from Apple Online Store from March 11 with free shipping or buy in store on Apple Retail Store starting at 5:00 p.m. on March 11.
iPad 2 with Wi-Fi only model is available in 3 variants of internal memory storage – 16GB, 32GB and 64GB, are priced at $499, $599 and $699, respectively. 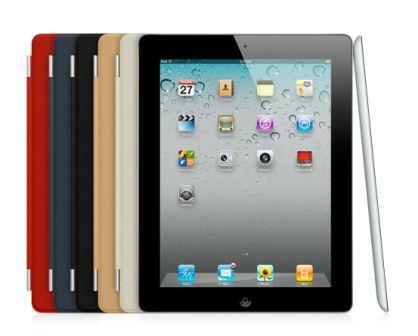 While iPad 2 Wi-Fi + 3G model adds more $130 compared to iPad 2 Wi-Fi, which are $629 (16GB), $729 (32GB) and $829 (64GB).